Daniel Ghinn examines the reactions of healthcare professionals to the new Prime Minister’s decision to keep Jeremy Hunt in her cabinet as Health Secretary. In my last article for this column, I looked at how doctors were talking about the EU referendum in the final days before the UK went to the polls. In the few weeks that have passed since then, the UK has seen political upheaval unlike any we have experienced in a generation. The UK public’s vote to leave the EU, the subsequent resignation of Prime Minister David Cameron and, in the last few days, the appointment of Theresa May as the new Prime Minister, all sparked much discussion among doctors. But perhaps the ultimate fuel for online conversation among healthcare professionals (HCPs) was the decision to reappoint controversial Health Secretary Jeremy Hunt to his role at the head of the nation’s health system on 14 July. Watching the political events of the past few days through the eyes of doctors and other HCPs provides a unique – often passionate – perspective on unfolding events as seen from the perspective of those working daily on the ground in healthcare delivery. Early in July, some HCPs pointed out that health secretary Jeremy Hunt was backing Theresa May for the Prime Minister’s role. “Yet another reason to stop May” retweeted one nurse. As soon as it was clear that Mrs May would become the new Prime Minister, some doctors talked of Jeremy Hunt being moved out of the cabinet. “I believe Jeremy Hunt will be reshuffled when Theresa May attempts to form a cabinet. Unless he imposes himself, of course” tweeted a consultant psychiatrist, referring to Mr Hunt’s move earlier this year to ‘impose’ a new contract on junior doctors. to appoint a new Health Secretary. Other doctors echoed this sentiment, expressing a hope that Theresa May would move Jeremy Hunt out of his role as Health Secretary. On the day of Theresa May’s appointment as Prime Minister, doctors became increasingly anxious about the future of the Health Secretary’s role. 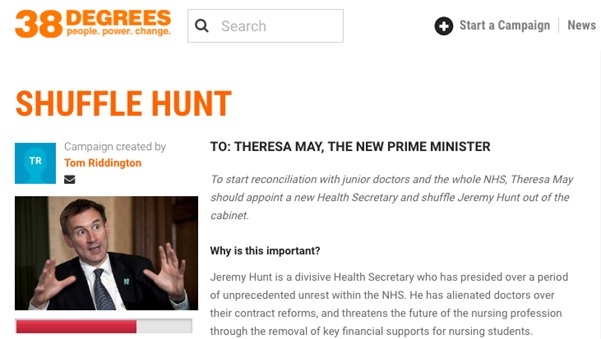 “For the love of God” tweeted a junior doctor to Theresa May’s Twitter account, “whoever runs this account please ask Theresa to dump @Jeremy_Hunt from health”, adding Twitter hashtags #huntmustgo and #juniordoctors. Has @theresa_may got rid of @Jeremy_Hunt yet?! Fear of the unknown… At least we all know how much of an idiot JH is and that we hate him! Later that morning, confusion broke out as stories initially emerged that Jeremy Hunt had been sacked from Government. This news was praised by many HCPs, who thanked Mrs May and supported her decision. @theresa_may@Jeremy_Hunt Whoop whoop – you got rid of him!! As hundreds of Tweets continued to share and support the news of Mr Hunt’s reported departure, news broke that he had, in fact, been retained as Health Secretary. Previously elated doctors reacted angrily: “@theresa_may has signalled that she doesn’t care about either #juniordoctors or NHS!” tweeted an influential online GP. By confirming that @Jeremy_Hunt stays as healthsecretary @theresa_may has signalled that she doesn’t care about either #juniordoctors orNHS! Just a few minutes later, Jeremy Hunt himself sparked a noisy Twitter response when he expressed his delight at remaining in the cabinet: “‘Reports of my death have been greatly exaggerated…’ Thrilled to be back in the best job in Government” he tweeted.
.@Jeremy_Hunt Only because nobody else wanted to do it. You still don’t have the confidence – or the support – of NHS staff, or patients. First to chime in among thousands of responses to Mr Hunt’s Tweet was Welsh propofologist Dave Jones, whose tweet stating that neither NHS staff nor patients supported Jeremy Hunt was widely shared – at the time of writing this piece just 10 hours later, it had been retweeted more than 400 times and liked more than 1,100 times, with hundreds of responses. For HCPs, social media has become a tool for learning and sharing, and for collaborating with peers in real time, often throughout the working day. When news breaks that is important to them – whether it is a leadership issue like the appointment of a health minister, or doctors’ reactions to news about a medicine – their response on social media provides an immediate picture of their developing perceptions. The opportunity for healthcare companies and organisations is to listen and learn what is important to the HCPs they serve. 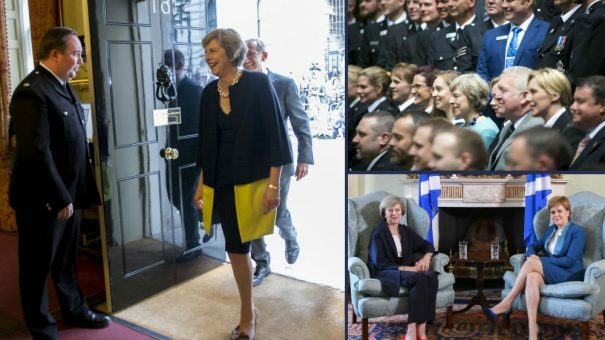 This article was written on 14 July, the day Theresa May announced her new cabinet. Source data was analysed using HCP Issue Tracking from Creation Pinpoint, an online insights platform. Daniel Ghinn is Founder and CEO of Creation Healthcare, the HCP online insights consultancy and inventor of Creation Pinpoint. He tweets at @creationdaniel.